MANILA, Philippines — Boy bands JYJ and TVXQ, whose members used to be in one group, have achieved No. 1 feats with their albums in Korea and Japan, respectively. “In Heaven” was released on Sept. 27 and in just four days, the album sold 136,500 copies to take the top spot. For the month, JYJ’s album was followed by KARA’s third album “Step,” Super Junior’s “Mr. Simple” repackaged album, Infinite’s repackaged album and Super Junior’s original “Mr. Simple” album. This is the first time that JYJ was included in the chart as the boy band’s album distributor was previously not a member of Gaon. 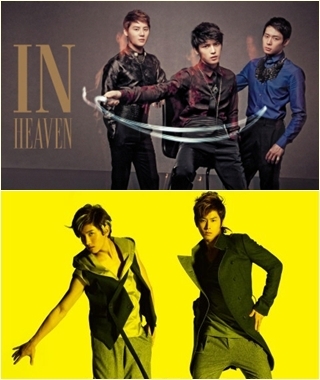 JYJ’s agency, C-JeS Entertainment, said so far, “In Heaven” has sold 350,000 copies based on its figures. JYJ achieved the feat despite that they are banned from promoting the album on TV music shows in Korea due to their legal dispute with SM Entertainment, their former agency. The three JYJ members sued SM Entertainment in 2009 to void their exclusive contracts. The Korean court handling the case has yet to issue a final decision. Based on figures released by the Recording Industry of Japan (RIAJ) for September, “TONE” sold 250,000 for the month and achieved platinum status. The album debuted at No. 1 on the Japan’s Oricon chart when it was released last Sept. 28, selling 105,484 copies. It also topped the Oricon weekly album chart with 205,000 copies sold.